JOINT DEVELOPMENT FOR LAND AND BUILDINGS.. Residential five storied building at Chandrnath Chatterjee Street. option to earn 12% till possession and more than 12% after possession. We provide exclusive range of all reputed builders in Delhi and NCR ranging from ordinary Apartment, Luxury Apartment, Penthouses, Villas which can match with your choice and financial budget. We also assist you in finding the most appropriate land that caters to your residential purpose. 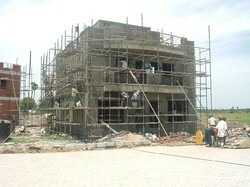 We are providing Residential Construction, building construction renovation architecture and interior design services..